On a fresh, crisp, Sunday morning, you and your spouse decide to take a pleasant drive through the country side. The sun is shining. The roads are clear and the driving is pleasant. You drive along long country roads. The windows are open allowing fresh air into the car. There isn't another vehicle in sight. You're driving the speed limit along the road, when all of the sudden, and without warning, a GMC Pick Up Truck drives out of hidden intersection and t-bones your car. The impact is severe and pushes your car off the paved roadway. Your car topples over, out of control and ends up in a ditch. The air bags deploy. Smoke is everywhere. You and your spouse pass out... What happens next? What do you do? What to do at the car accident scene? At the accident scene, people are always focused on whose fault the accident was. After impact, you often see drivers leaping out of their cars in fits of rage, finger pointing to cast blame. This behaviour, while fuelled by emotion and adrenaline is counter productive and will have zero impact whatsoever on the outcome of a personal injury case. The most important thing following a car accident is to ensure that everyone's safety and health is intact. Call 911 right away. At the most serious accident scenes when a party is critically injured you will see that the police will block off the road, interview the witnesses and leave the injured drivers/parties to the paramedics. Police know that the details of the accident will take care of themselves. Police have forensic technology to re-create the accident scene after the fact to determine exactly how the accident happened, and who was at fault. Don't be pre-occupied on casting blame at the accident scene. If the other driver ran a red light, ran a stop sign, or was driving drunk, this will be blatantly obvious to the authorities and to witnesses. Focus on getting medical treatment for your injuries. Focus on getting to the hospital to get checked out. Focus on the health and wellness of your friends and family members. Call 911. Report the car accident to the police, ambulance, fire department, or all three depending on the severity of the accident. Exchange insurance information with the other driver. If the other driver didn't have insurance, get their contact information and driver's license number/plate number. Gather the names and contact information of all witnesses to the car accident. Co-operate with the police in their investigation. If ambulance assistance is offered to you at the accident scene, take it! If the police don't attend at the accident scene, attend at your local collision reporting centre. Take photos of the damage to the vehicles, your injuries and the accident scene. Use the phone in your camera if necessary. If the ambulance doesn't take you to the hospital because they don't deem you to be injured enough, then seek medical attention immediately. Go to your local emergency department and wait. Go see your family doctor. Go to a walk-in clinic. Finally, report the car accident to your car insurance company. The initial days following the car accident can be very difficult for the accident victim, friends, and family; particularly if the injured party has been kept in the hospital due to the traumatic nature of their injuries. If your loved one has been kept overnight or for days at the hospital because their injuries are so bad, then visit them as much as possible. It's important to be by their side for support, and to look after them if the nurses aren't on the ball. Call a personal injury lawyer right away . 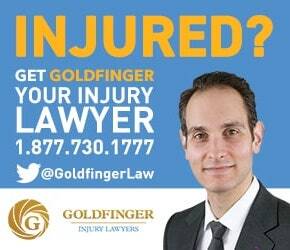 A good personal injury law firm, like Goldfinger Injury Lawyers, will even meet with you and your family at the hospital following the accident. If the injuries are serious, it's no time to mess around or delay. More on that in the next section. Sometimes pain from car accidents doesn't surface until 24-48 hours after the accident took place. Sometimes people leave an accident scene without getting any medical attention because they feel fine, but wake up the next morning unable to move because of pain or stiffness from the car accident. If you or your loved one didn't get medical attention in within the first 24 hours following the car accident, then it's important to get medical attention right away in the following 24 hours. Why? A judge, jury or insurance company will have a difficult time accepting your argument that you deserve compensation for your injuries if you didn't bother getting any medical attention after your car accident. How bad could your pain have been if you didn't even bother seeing a doctor? Don't look for any sympathy from the judge, jury or insurance company in this situation. If you want to claim compensation for your injuries, accident victims need to document their pain. The way we do this in Ontario is by showing the doctors' records to the Court and to the insurance company. If you fail to see your doctor, then there will be no records to paper your pain trail. This is not good for a personal injury case; although it's not fatal to it either. Still, it's beneficial to your personal injury case to document your pain through doctor's visits as soon as possible following your accident. It should be noted that Courts and Insurance Companies will draw a negative inference if you didn't see your doctor after your accident. They will infer that because you didn't see your doctor, then you must have been healthy. After all, injured people, or people in pain go to see a doctor for their injuries to get better. Healthy people don't need to see a doctor because they're not injured. So, Ontario Courts and Insurers will make the connection that you must have been healthy because you didn't see your doctor after the accident.